A black swan that was caught off guard, another listed company was bigshareholder"Holding out". On the evening of April 14,Sundiro A (000571)Suddenly a "black swan" flew out, and the listed company was capitalized by a large shareholder affiliated company with a capital of 480 million yuan. Company stock will be tomorrow (April 16)Resumption of tradingAnd by ST (delisting risk warning), the securities abbreviation becomes "ST continent". According toChoice dataIt shows that as of September 30, 2018, the number of shareholders of Sundiro A was as high as 90,400. It is worth noting that since 2019, once the listed company has been affected by ST, the stock price has staged a continuous downslide. One of the worst cases isInfront Micro (000670)After being affected by ST on March 27, the stock price continued to fall sharply. As of the close of April 15, the stock price fell more than 36.8%. Why is the new continent held by 90,000 people suddenly struck by ST? On the evening of April 14, Xindazhou released 5 intensiveannouncementFrom which a "black swan" is flying: Hengyang Niuye, an affiliate of the major shareholder, occupies 480 million yuan of funds of the listed company. It is expected that the capital occupation will not be resolved within one month. According to the data, Hengyang Niuye, registered in Heilongjiang Province, was established in 2005. Its business scope includes cattle and sheep slaughtering and processing; and frozen food. It is worth noting that Xindazhou A's largest shareholder: Shangheng Guantong Investment, indirectly holds 34.8935% equity of Hengyang Niuye, and in fact the controller is the director of Hengyang Niuye. Xiaojing combed the announcement and learned that due to related transactions, only 2018, Hengyang Niuye occupied the non-operating funds of Xindazhou A as high as 477 million yuan. Shanghai Hengyang, a wholly-owned subsidiary of Sundiro A, purchased beef from Hengyang Niuye and paid 741 million yuan in advance, but only received 117 million yuan of beef, which was used by it. According to the 2018 annual report auditing firm, Licensing Co., Ltd. confirmed that 2018 of the above-mentioned related transactions caused Xindazhou A to be occupied by non-operating funds of Hengyang cattle industry totaling about 480 million yuan. The 477 million yuan “black hole” brought by Hengyang Cattle Industry has already shown signs. It should be noted that in the semi-annual report of 2018, New Continent A has repeatedly stressed that “the funds are relatively tight”. In the first three quarters of 2018, the net cash flow from New Day A's operating activities was -306 million yuan, a year-on-year decrease of 227.32%. The main reason was the increase in trade prepayments of the food industry subsidiaries. Affected by this, the new continent APerformanceThere will also be the first loss in the past 10 years. 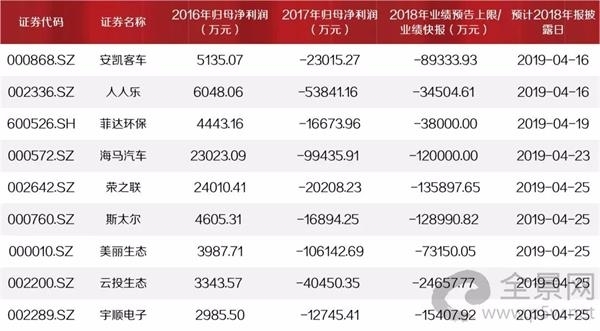 According to its 2018 performance report, the mother returned to 2018Net profitWill lose 7-8 million yuan. How bad is the ST in the past? Due to the sudden "black swan" in business operations, the listed company was affected by ST, which is hard to prevent. Moreover, the “penalties” of such events in the secondary market are very serious, and the stock price has all fallen into a crash. In 2019, such tragedies have been staged many times. March 25,Infront Micro (000670)Sudden announcement, because the company’s US data center leasing business has terminated cooperation with customers andcontractWithin three months of the termination, it has not returned to normal, and it is expected to be difficult to recover within the next three months. Since March 27, the company's stock abbreviation has been changed from “Yingfangwei” to “ST Infront”. Since then, the stock has continued to perform a word limit, ending at April 15th, during which the stock price has fallen by more than 36.8%. On the evening of April 8, 2019, the same amount of money was used by the shareholders of the listed company.Tibet Development (000752)Announcement that the company's stock will be ST. Affected by this news, the company continued to fall after the resumption of trading on April 10, and has been four consecutive downs. Qiulin Group (600891)The gold business has been discontinued and shut down in recent days, and it is expected that normal production will not resume within three months. The company's stock was taken by ST on April 10. The company's stock has also suffered four downs. 5 Other circumstances identified by the firm. At the peak of the annual report, please avoid these 35 shares. The "black swan" in the business of listed companies cannot be predicted. The “*ST” of the listed company due to the performance loss is a risk point of the clear card. Careful caution can completely avoid the thunder. In late April, it will be the highest peak of the A-share annual report. Investors must be alert to the risk of listed companies being *ST.
Judging from the disclosed 2018 performance report and performance forecast, there are as many as 60+ listed companies whose performance has suffered losses for two consecutive years, of which up to 57 annual reports have not been disclosed, including 4 losses due to performance for 2 consecutive years. Listed companies, and 31 stocks that are normally traded (excluding GEM listed companies). Renren's annual report shows that the loss of 355 million yuan in 2018, the company's stock will be suspended for one day on April 16, the resumption of trading on the 17th and was implemented by the "delisting risk warning", the stock abbreviation changed to "*ST people". 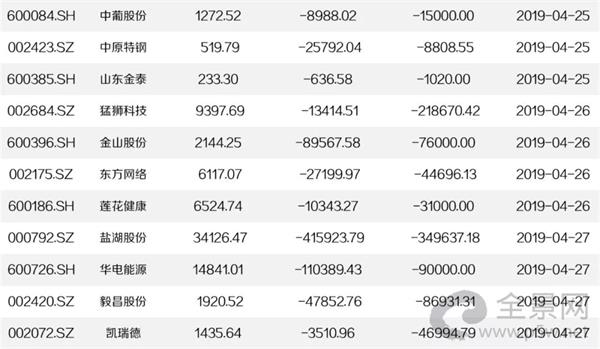 Of the 31 stocks that were not *ST, the highest loss wasSalt Lake shares (000792),It is expected to lose more than 3.2 billion yuan in 2018, and has suffered a huge loss of more than 4.1 billion yuan in 2017. In addition,Xinwei Group (600485)It is also expected that the net profit for 2018 will be -2.87 billion yuan to -3.47 billion yuan. Two notices have been disclosed: due to losses for two consecutive years, the risk of delisting will be implemented after the disclosure of the annual report in 2018. For listed companies that have already been *ST, the exit from the market is even further. If the annual report in 2018 is again lost, it will face a “suspension of listing” and even a “delisting” tragedy. According to the data, four listed companies that have been *ST will continue to lose money in 2018. Among them, *ST Huangtai and *ST Shangpu may be suspended due to losses for three consecutive years, while *ST Zhonghe and *ST Huaze may be forced to withdraw from the market due to four consecutive losses. 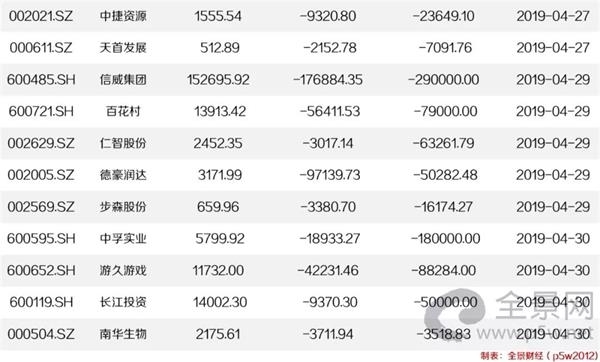 In addition,*ST Kaidi (000939)It is estimated that the loss will be 5 billion yuan to 6 billion yuan in 2018. And recently issued a risk warning that the company's stock may continue to be issued an audit report that cannot express opinions or negative opinions due to financial reports, and there is a risk of suspension of listing. Eight daily maps of A-shares: Liquidity + Fundamental "April Day" brokerages said that the expectation of "the second wave of the bull market" is ignited? Xiangcai Securities: Why did the market not continue to skyrocket? Increase the amplitude of the pull up again! [new stock] Guangzhou Agricultural Commercial Bank prospectus data is now "Oolong"